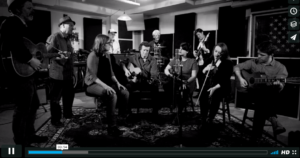 In case you missed it, the folks at Nano Fest have posted a great video of Chris, Rose Polenzani, Session Americana, and others covering the Woody Guthrie song “Deportee.” Click below to watch the video. NPR’s Mountain Stage made a list of its Best Performances of 2016 and Chris’s performance of “Leave the Light On” is one of them! Did you miss Chris on Mountain Stage? Hear him on the new Mountain Stage to Go podcast (#MS2GO). The “American Routes” interview that Chris did with Nick Spitzer (live at the Parlor Room) will air nationally the week of October 2. Check your local station for airtimes. On September 25, Chris will join Billy Bragg & Joe Henry, Robert Ellis, and others for a live performance on Mountain Stage in Pittsburgh, PA. Tix & info on the Concerts page. Lots of new dates on the tour schedule for this fall, including stops all over New England, California, and Colorado. Visit the Concerts page for full details. Time to plan start planning your summer road trips? Chris is playing at a number of festivals this year, and will be doing some concerts as well. Check the Concerts page for the full schedule.